This two ingredient dill potato salad could not be easier to make! Perfect for those last minute picnics. Bonus: No mayo. You read right – 2 ingredient dill potato salad. We’ve all been there. Pretty much every time I get invited to anything I’m there. 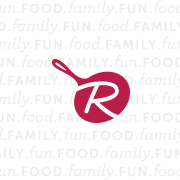 I don’t know why – I love to cook and bake but as soon as I have to consider timing it, transporting it, and making something that will please a large crowd, my mind goes blank. BLANK. 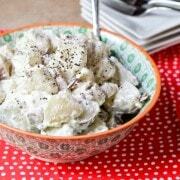 But we all know potato salad is a winner at any and all picnics, especially 4th of July picnics. Independence day! What better way to gain independence than making a salad that only involves two ingredients. Hello freedom! Freedom to sit down and watch your kids play in the backyard. Freedom to sip on some wine. Freedom to shower! Whatever you want, because you won’t be slaving away in the kitchen with picnic prep. Make this potato salad, some easy baked beans, and some burgers. Party perfection. No one said entertaining had to be fancy, especially not on the 4th of July. Ready for the secret to this dill potato salad? It’s Greek Yogurt Dip! As you know, I partner with Sabra and I’ve teamed up with them to create this easy peasy potato salad. You’ll also add salt and pepper to this dill potato salad, but those don’t count as “ingredients” because they are kitchen staples. 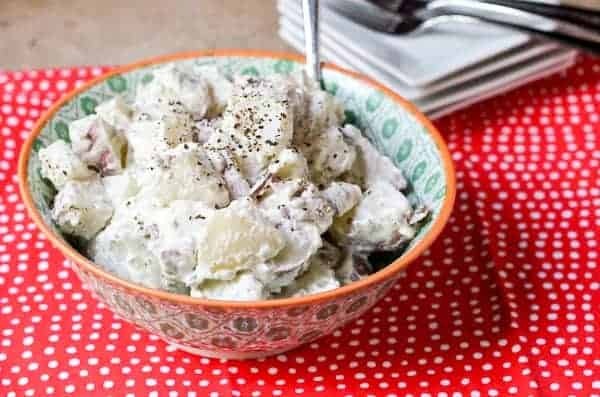 If you have some fresh dill in your garden, you may want to consider sprinkling some of that on this potato salad just prior to serving, but the yogurt dip already has tons of great dill flavor. Place potatoes in a large pot of generously salted cold water and bring to a boil over high heat (covered). Reduce heat slightly, maintaining boil. Boil for 15 minutes or until just tender. Drain and let cool so that you can handle them. Cut into bite size pieces and place in a large bowl. Add Sabra Cucumber Dill Greek Yogurt Dip and mix to combine. Garnish with additional fresh dill or fresh cracked pepper. Keep refrigerated or serve immediately. Best served immediately. Note: How much Sabra Cucumber Dill Greek Yogurt Dip you add will depend on how creamy you like the salad. If you make it ahead, you may want to add more just prior to serving. Verdict: Loved the dill flavor in this salad and the light creaminess of it. And of course, the simplicity. Husband’s take: Dude just isn’t a potato salad fan no matter which way you try to sell it to him. Not a huge potato fan and not a huge creamy-stuff fan. Difficulty: Doesn’t “two ingredient” say it all? Looking for more great picnic-ready salads? Try: Quinoa Wheat Berry Salad, Greek Chopped Salad, Herbed Israeli Couscous Salad with Tomatoes and Mozzarella, Cucumber Avocado Salad, or Basil Pesto Hummus Pasta Salad. Disclaimer: As a Sabra Tastemaker, I’ve been compensated for creating and sharing this recipe. All opinions are, as always, my own. I often buy Sabra products with my own money, and after visiting the headquarters and production facility last year, I fully stand behind their products. Thanks for supporting my blog by reading about brands I use and love. Tuna White Bean Salad Flatbread – 27g protein and less than 300 calories! The Cucumber Cups with Hummus looks simple and I can see serving it as an appetizer. It gave me the idea of using the one inch cucumber “bites” as a base to hold other ingredients like chicken salad or egg salad. I like the marinated chicken kebabs recipe. I liked the avacodo salad! The Cucumber Avocado Salad Recipe looks refreshing and easy to make for summer parties! Grilled Flatbread with Hummus & Mixed Veggies. WOAH! I didn’t know Sabra made other kinds of dip. I love the idea of this one!! I must make the S’mores dip! Must. Make. It. The marinated chicken kabobs look great! I would LOVE to try the s’mores dip it looks and sounds amazing!!! The S’mores Dip recipes looks amazing! Would be great after a holiday BBQ! I want to try this one but from the website, I picked the cucumber and avocado salad. The Smores dip looks delicious!!! I think the Grilled Flatbread With Hummus & Mixed Veggies Recipe looks great!! LOVE this and totally stealing it at some point this summer because I fall victim to the mind blankness too every single time someone asks me to bring something! I love the Smores Dip! The Cucumber Avocado Salad seem like it would be great to make. Oh my goodness, this potato salad looks fantastic! Love that you only need two ingredients. I had no idea they had a Greek yogurt dip, it sounds amazing! I’m all about dessert, so the Spiced Hummus Cake With Vanilla Yogurt Frosting is one recipe I plan to try. Looks beautiful, and sounds delicious. Creamy Bruschetta Recipe sounds delicious! The Cucumber Avocado Salad Recipe seems amazing! I LURV avocados. I would pick the Avocado Cucumber Salad. I also have to choose Cedar Plank Salmon as well, since I’m from Alaska and must plug wild caught salmon as the best salmon ever! The individual 7 layer dips looks so cute, and delicious! I can’t wait to try my hand at some! The cucumber avocado salad looks great! Ilove the Individual 7 Layer Dip, they looked delicious and gorgeous! I would have to pick the Cucumber and Avocado Salad, especially since its summer and hot out. The creamy bruschetta dip sounds delicious! That Southwest Parfait looks amazing! I would love to try the s’mores dip with the Cinnamon Sugar Pita Chips. I love the Mediterranean Chicken Burgers!! The Roasted Pine Nut Hummus sounds perfect with this! I would give the Chocolate, Coconut and Caramel Hummus Pastries Recipe a try! My favorite is the OC Cali Dogs! There were many I liked but the greek salad caught my attention. The Cucumber Avocado salad looks delicious and I am definitely going to try it and I loved the two ingredient potato salad! My favorites are the Mediterranean Chicken Burgers, Cucumber Avocado Salad, and Spiced Hummus Cake With Vanilla Yogurt Frosting. I would make the mini apple pies! I like the Basil Pesto Hummus Pasta Salad recipe. The S’mores Dip recipe looks yummy and who doesn’t love S’mores in the summer. The Southwest Parfait looks good. The Marinated Chicken Kebabs looks delicious. The Grilled Veggie Flatbread looks yummy! thanks for chance! I want those mini apple pies!! I think the smores dip looks good. the Mediterranean Chicken Burgers Recipe looks amazing! I lone the S’mores recipe. The cucumber avocado salad would be nice to try. Mini apple pie looks delicious! The mini apple pies are too cute! I’d love to try this. I am loving the sound of the Southwest Parfait Recipe! The beans, the corn, the rice, the hummus…..I could go on and on!!! Delicious!! The S’mores Dip Recipe was my favorite, but I think I might try the 2 ingredient potato salad for our picnic this weekend. Potatoes and yogurt – who’d have thought. Thanks for the recipes and the giveaway opportunity. Creamy Bruschetta Recipe or the hummus egg salad would have to be my fave! The S’Mores dip sounds so great. My favorite recipe is the Grilled Flatbread with Hummus & Mixed Veggies Recipe. I am intrigued by the cucumber avocado salad. I love the recipe Cucumber Cups Recipe – it is really different and so refreshing! The cucumber and avocado salad sounds really good! The hummus & veggie flatbread looks amazing! We love grilling in the summer time and kebabs are a favorite so I’m always on the the lookout for new recipes so we don’t get bored. I love the Marinated Chicken Kebabs! My favorite recipe is the Southwest Parfait. The marinated chicken kebabs looks easy and delicious! I would like to make the Cucumber Avocado Salad! The Mediterranean turkey burgers look delicious. Cucumber and Avocado Salad I have got to make!! Cucumber Avocado Salad, I have got to make!! Oh my! The Chocolate, Coconut And Caramel Hummus Pastries is a must try!! I think I’ll have to try to Creamy Bruschetta Dip at my next BBQ! I would love to try the individual 7 layer dip! The Basil Pesto Hummus Pasta Salad looks amazing! I invite you to share this frozen yumminess at the Thursday Favorite Things blog hop. You can link up through Saturday at midnight. Thank you for the giveaway opportunity too- I like the individual seven layer dip recipe. Please stop by and enter my giveaways too Hugs! the whole feast for the fourth menu looks yummy, especially the veggie flatbread! My favorite would be the Cucumber Avocado Salad Recipe! I would love to make this for the 4th of July! I am in love with this simple potato salad. Definite bonus with no mayo! 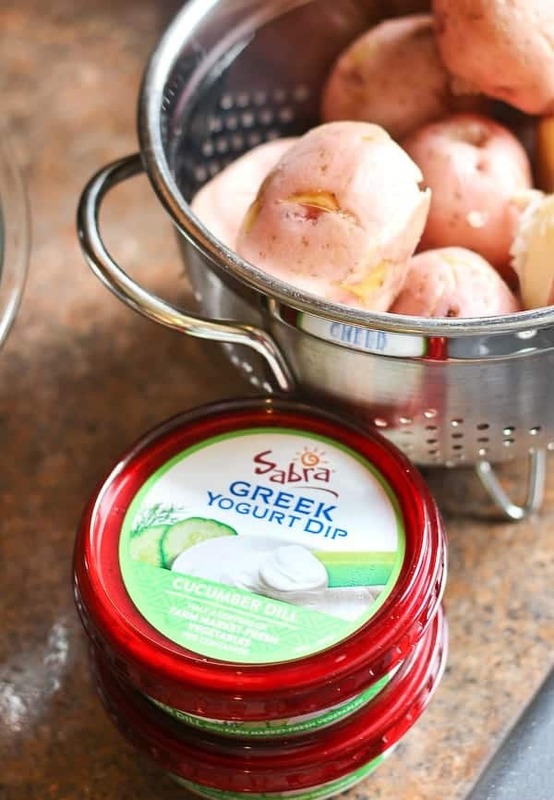 Using Sabra’s yogurt dip is a great idea! My favorite is, “Grilled Flatbread With Hummus & Mixed Veggies Recipe.” It looks so delicious. Creamy and delicious summer salad goodness, love the simplicity and authenticity of this recipe. I like Cucumber Cups Recipe. oh gosh, their S’Mores Dip looks really yummy. But 2 ingredients for this potato salad? That’s just awesome. I had no idea they had a Greek yogurt dip- such a great idea to make potato salad with it! I like the looks of the S’mores Dip Recipe. Stacy’s Chorizo Sliders look good. But I’m also going to try your salad, 2 ingredients is definitely a dish you want to have your summer rotation. I think the Mediterranean Chicken burgers would be my choice. They sound really tasty. The Moroccan Meatball Sliders and Spiced Hummus Cake With Vanilla Yogurt Frosting are some of the recipes I would like to try. I like the Individual 7 Layer Dip recipe because it looks really cute & fun! Guests would love to have one all to themselves. It looks delicious & festive! They had me at the S’mors dip! The Creamy Bruschetta recipe sounds tasty! 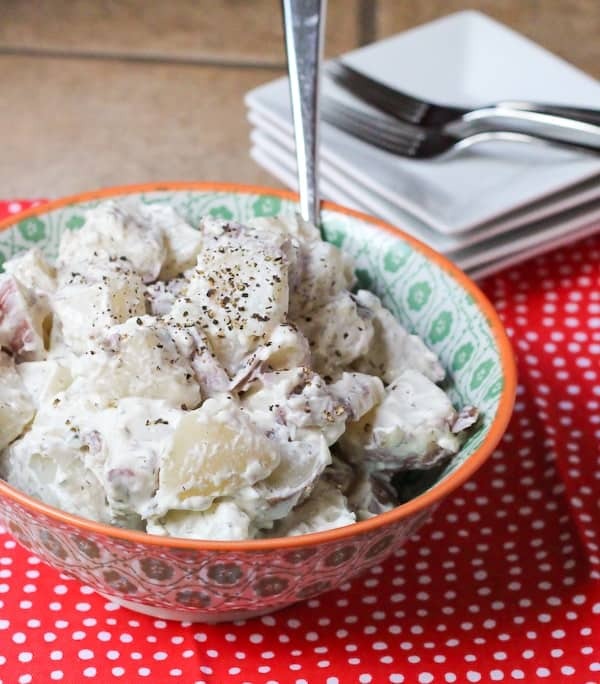 Two-ingredients potato salad – count me in! This would score some major points at any get-together this summer! Also, I can’t wait to try the creamy bruschetta dip! The Mediterranean Chicken Burgers sound great! I am ALL about the Roasted Garlic Pinwheels, and the mini apple pies sound fantastic as well! Congrats Emma, you won! I sent you an email with details regarding how to claim your prize – make sure to check your spam just in case. 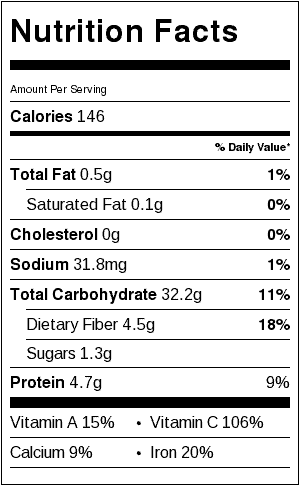 I’m going with the Mini Apple Pies though the Loaded Chopped Salad With Chipotle-Hummus Dressing sounds delicious, too. The Cucumber Avacado Salad sounds great! It would please everyone in my house – especially my kids! The cucumber avocado salad recipe is my favorite. Just yersterday my neighbor brought me cucumbers from her garden, and I’m also a huge fan of avocado. 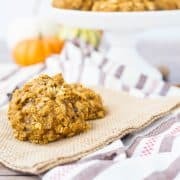 Oh, my gosh, this is such an easy AND delicious recipe! Need to pick up some Sabra cucumber dill dip!!! if i had my druthers, i’d eat apple pie every day, and those minis sound great! 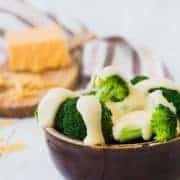 Okay, LOVE that this is just two ingredients, what a great way to use the yogurt dip! The grilled veggie flatbread sounds delicious! My favorite would be the Cucumber Avocado Salad Recipe, looks refreshing. Their southwest parfait looks awesome. I make something similar, but will have to try their version, which uses hummus. Thanks for the chance! I would like to try the S’mores Dip! The Mini Apple Pies look delicious!